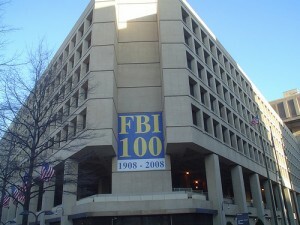 The FBI’s current headquarters in Washington D.C., named after J. Edgar Hoover. 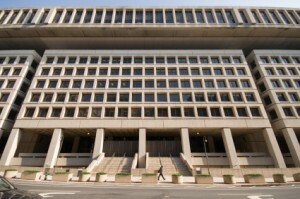 The long-delayed plan to build a new FBI headquarters has hit yet another snag. House lawmakers said they aren’t comfortable funding a new headquarters until the Trump administration can justify why it scrapped a decade-long plan for a new building in the suburbs. Trump’s plan calls for demolishing the J. Edgar Hoover headquarters in Washington D.C, and constructing a new building in its place. The new proposal prompted the General Services Administration Inspector Carol Ochoa to open an investigation into the sudden change in plans. The omnibus bill, however, includes $370 million for other FBI construction projects. But on Friday morning, Trump threatened to veto the bill. 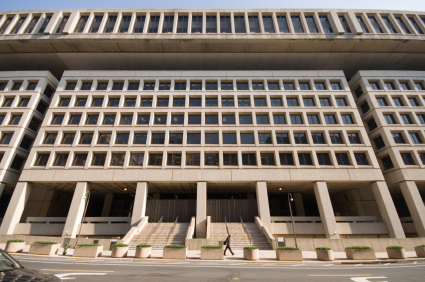 Long-stalled plans to build a new FBI headquarters outside of District limits has taken a stunning, expected turn: The General Services Administration appears to prefer building the bureau’s new home at the current site, the Washington Business Journal reports. 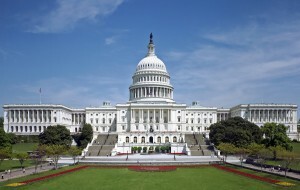 The GSA faces a deadline today to submit a detailed plan to the Senate’s Committee on Environment and Public Works on efforts build a new headquarters. But the GSA’s apparent endorsement of building on the current site is not the final word because additional appropriations would require congressional approval. 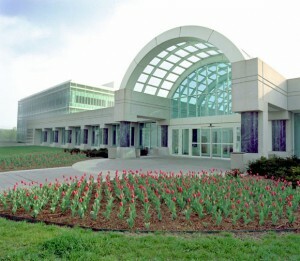 The current headquarters, built in 1974, is dilapidated and no longer useful to the FBI. A new headquarters is expected to house the 11,000 FBI staff members who are spread across multiple locations in the region. Posted: January 30th, 2018 under News Story. If you’re wondering whether the FBI’s new headquarters will ever be built, you could be forgiven. For years, federal officials have been planning to build a new headquarters in Maryland or Virginia. But every year passes without funding. Now Congress is scrambling to secure more than a billion dollars by next month to proceed with the project, the Baltimore Sun reports. “A vague, three-sentence statement released this month by the agency overseeing the $2 billion development — as well as silence from President Donald Trump, a former real estate developer — has shifted the discussion from whether the headquarters will be built in Maryland or Virginia to whether its progress will be delayed indefinitely,” the Baltimore Sun wrote. To keep the project going, Congress must secure $1.4 billion for the building by April 28, when current spending authority expires. Posted: March 27th, 2017 under News Story. President-elect Donald Trump, who has mocked U.S. intelligence agencies, plans to restructure the CIA and reduce staffing at its Virginia headquarters by moving more people into field posts worldwide. Sources familiar with the planning told the Wall Street Journal that Trump believes the Office of the Director of National Intelligence has become politicized and bloated. Trump has criticized the CIA and other intelligence agencies for what he says are misrepresentations of Russia trying to influence the presidential election. His criticism of those agencies has drawn fire from both sides of the aisle. Posted: January 6th, 2017 under News Story. A Homeland Security analyst who carried a gun, knife, handcuffs, pepper spray and an infrared camera into the agency’s headquarters in June pleaded guilty Wednesday to making illegal silencers. Jonathan Wienke faces up to 10 years in prison and a $250,000 fine after authorities also found explosives and gun silencers at his Martinsburg home in West Virginia, the Associated Press reports. Wienke likely won’t serve anywhere close to 10 years in prison because of a deal with prosecutors for a reduced sentence. Authorities said there was “no indication” that Wienke planned violence in the workplace. Posted: December 22nd, 2016 under News Story. The long-delayed effort to build a new FBI headquarters has gotten the green light from the House Transportation and Infrastructure Committee to move forward. But the GSA still needs to finalize the location of the new headquarters, Federal News Radio reports. The committee approval was praised by chairman Rep. Bill Shuster, R-Pa.
“This will greatly improve the FBI’s security posture and its operations, and save money. But because of the size and complexity of the project, it will important to ensure there is strong congressional oversight to keep the project on time and on budget,” Shuster said. The plan calls for the GSA and FBI to pay for the headquarters. President Obama’s 2017 budget proposal includes $1.4 billion for the project, which has already received $390 million under the fiscal 2016 omnibus spending bill. Rep. Lou Barletta, R-Pa., said many challenges are involved. “What makes this project challenging is it is not a simple construction project of a single building. The project will be a secure campus with separate visitor screening, its own utility plant and specialized security requirements,” Barletta said. Posted: December 8th, 2016 under News Story. The ATF National Headquarters in Washington D.C. will be renamed on Friday to honor Special Agent Aerial Rios, who was killed during an undercover operation in Miami in 1982, Guns.com reports. Rios, who was a special agent for five years before his death, met with two suspects at a Miami hotel to buy large quantity of cocaine and machine guns on Dec. 2, 1982. When one of the suspects became suspicious, a struggle ensued and Rio was shot. 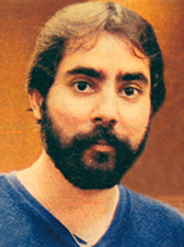 Fellow agent Alex D’Atri also was shot but he survived after numerous surgeries. The former ATF headquarters was named after Rios in 1985, but when the agency left, the EPA took over the building and renamed it the William Jefferson Clinton Federal Building. Posted: November 29th, 2016 under Milestone, News Story.